Are Business Cards stuck in the dark ages? Maybe you order them by the truckload, or only use them on rare occasions. You may insist they’re essential, or view them as dusty remnants of “ye olden days.” Whatever your feelings about Business Cards, it’s worth exploring the origins of these mini-messengers. Better yet, let’s take a look at why on earth we’re still using them! Rumored to have originated in 15th century China, “visiting cards” were offered in order to declare one person’s desire to meet with another. In 17th-century Europe, they were the size of playing cards and doubled as stationery for making notes and sending messages. The visiting card’s little-known cousin, the “trade card” acted as an advertisement, complete with helpful directions to the business in question. (Google Maps, anyone?) By the time the 19th century rolled around, “calling cards” were standard fare for both social and business calls alike. As the presentation of cards for purely social reasons plummeted in the 20th century, a combined version of the trade card and the calling card evolved rapidly to become the “business card” we acknowledge as standard fare today. The takeaway from this little history lesson? While there are some undeniably clever and creative exceptions to the rule, the majority of folks still opt for a Business Card format that’s been in circulation for well over 100 years. Can we attribute this crazy fact to general laziness? Resistance to change? Budget limitations? Or could it be that this 3.5 x 2-inch scrap of paper still has legs? I like to think of it as an “all of the above” scenario. From a practical standpoint, people are more likely to conform to well-established norms, and far-flung concepts are often expensive and don’t always provide their owners with a worthwhile ROI. There’s strength in simplicity. Your sales pitch and social skills may be well-polished but if they’re paired with a poorly-designed BC (or promotional thingamajig), prospects will be less likely to follow up with you. Plus, there’s something fun and ritualistic about the act of exchanging cards — it’s a true “icebreaker meets first impression” moment — and we humans love our rituals. Your card speaks volumes about you in mere milliseconds, so it’s smart to make sure it fits your professional vibe. Think of your Business Card as a savvy matchmaker that arranges introductions and puts a foot in the door for whatever comes next. Clutter is not your friend when it comes to cards (or anything else, for that matter). You may be itching to include the Logos of all 6 social media platforms you frequent, but is that truly necessary? Stick to one or two — or better yet — skip the icons and invite people to visit your website, where they’ll be able to connect with you in a zillion different ways. Nothing ruins a good Business Card more thoroughly than a bad Logo. Second runner-up: a Logo that’s too large, too small, or doesn’t relate well — in terms of size/placement/style — to the rest of the information that’s presented on your card. If you’re not sure whether your own Logo is up to snuff, ask it these three questions. Speaking of questions, you ask your Logo to do a lot. It communicates your company name, hints at products and services, conveys an overall tone, and distinguishes your work from competitors. In addition to these non-verbal cues, a well-written Tagline seals the deal with a brief description that helps readers fully grasp your purpose and vision. Color can make or break a Business Card. Setting aside the fact that it’s about the most subjective thing around, color has a way of strongly projecting your signature style and approach. A high-energy company might look its best in a bright range of colors, while a company with a minimalist philosophy may be well served by a one- or two-color palette. ~ Don’t draw a blank. There may be some good reasons to leave the flip side of your card unadorned, but I’ve yet to hear one! Make your mini-messenger do double-duty. Whether it contains useful information, showcases your work/website, or simply reiterates your brand through color and texture, the back side of your card is bursting with untapped potential. From the font you select to the paper you print on, make good on the promise your card implies. If you sell handcrafted vegan cheese, your card probably shouldn’t print on a slick, glossy stock. If you manufacture solar panels for large corporations, choose a clean sans serif typeface over a funky script font. Common sense helps avoid confusion. Straying from the standard format can be fun and effective, so long as it’s smart from a budget and shelf-life standpoint. For example, a microbrewery might hand out customized beer coasters or bottle openers. If you go this route, be sure your “calling card” feels clever vs. gimmicky. Ideally, you’ll want it to serve its purpose well past the next Oktoberfest. If you’re looking for a less expensive way to set your card apart from the rest, try a slightly modified size. A skinny, square, or round-cornered card can add interest, especially when it dovetails with the overall design. A hodge-podge of some Business Cards I’ve created over the years…both the front sides and the backs, of course! So what’s the next phase in this process of natural selection? Surely there’s a tech-savvy, green-friendly solution that will soon take the place of our beloved paper cards? There have, in fact, been numerous attempts to overtake the old school ways, none of which has completely succeeded. From Bizz and Zap to CamCard and Abbyy, there are plenty of apps that will help you design, scan, email, and store card information. Google’s app (now scrapped but certain to resurface in one form or another) asked users to physically Bump their smart phones together in order to swap digits. The smartest apps, like Haystack, acknowledge that paper isn’t going anywhere — at least for the time being — by offering both digital card designs and a feature that snaps and stores photos of conventional cards. 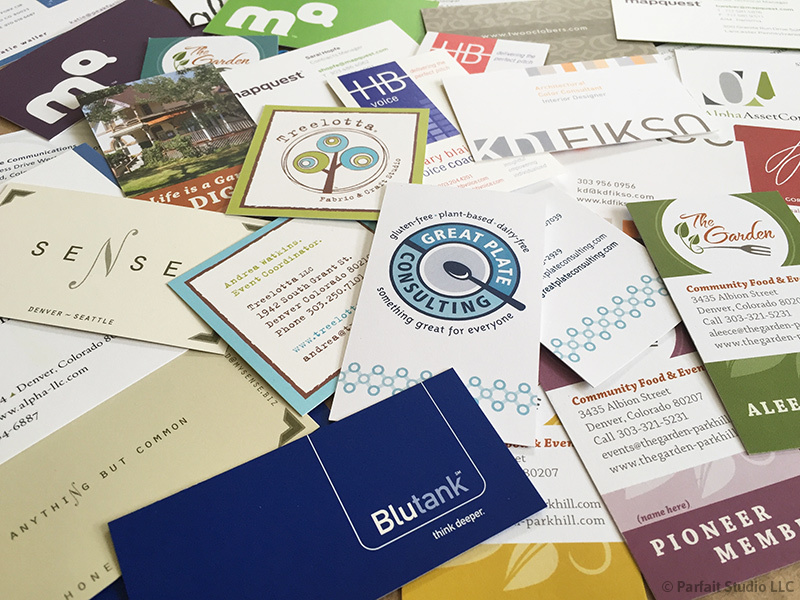 For now, there isn’t a singular solution that’s managed to unite the masses, which means standard business cards still dominate most conferences, trade shows, and networking events. Perhaps there won’t ever be a clear-cut answer to the question of how we store each other’s contact information. Much like the “print is dead” argument (the one that incorrectly predicted traditional books would die off completely to make way for digital ones), there may be enough room for both paper and virtual cards in the future. There will always be those who prefer the tangible to the virtual: paperback vs. Kindle; 1-hour photo vs. iPhoto; vinyl vs. MP3…the list could populate an entire blog post of its own! In the meantime, there’s no denying the fact that a well-designed Business Card is still a powerful marketing tool. 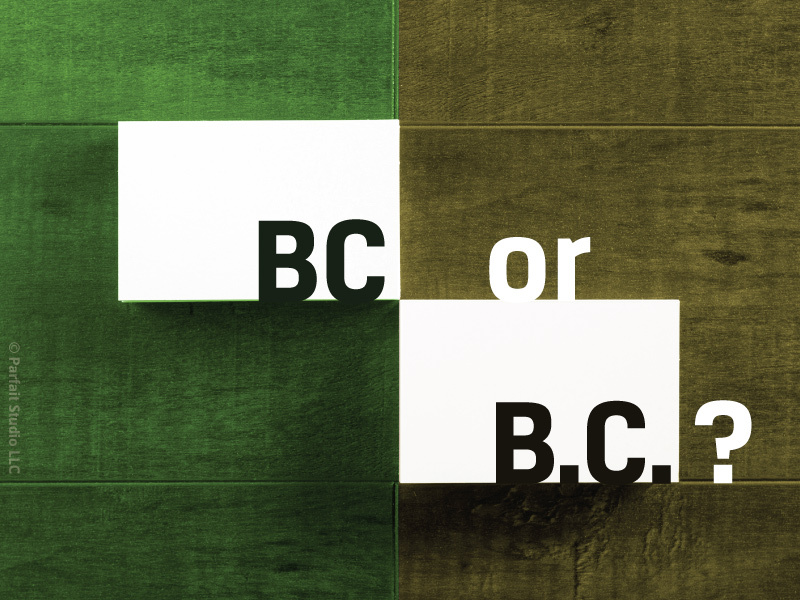 So, if your BC is feeling a little “B.C.” these days, I’d love to help bring it out of the dark ages with a fresh look and feel. When you’re ready to chat, my contact information is readily available…just don’t ask me to bump phones with you. The ritual of exchanging business cards is alive and well. I love it! Maybe that is because Parfait Studio designed my business card! Thanks, Jacquie, glad my timing was good! I just checked out your website and love the biz name and concept. Have fun with your new BC design!